Burton creates some crazy fascinating characters. We're talking hatters that are neon and crazed, Halloween kings, re-animated brides, and of course, the boy with scissors for hands. If your'e attempting to recreate a costume of Burton's complex macabre creations, you might have a hard time. Particularly with Mister Scissorhands. 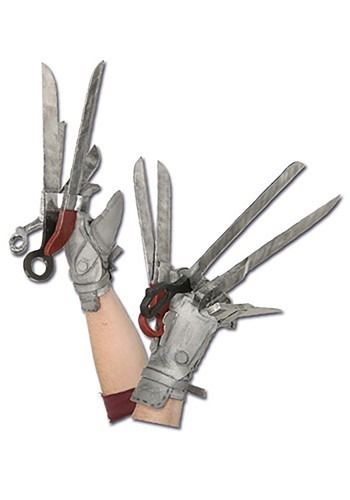 But before you start dismantling scissors and gluing steak knives to your knuckles, consider our Deluxe Edward Scissorhands Gloves. They're simply black and gray gloves that you pull on over your normal human fingers. Over the fingers on the gloves are plastic scissor blades attached for the full effect! Well not full effect. These gloves will not allow you to trim hair or shape shrubbery. But hey, you'll look like the morose teen, just without the danger of cutting yourself.